Understand how soil type and biology affect the resistance of exposed salt marsh areas to the eroding forces of waves and tides. Develop methods for mapping such resistance and its variability across space to allow prediction of marsh loss in different areas of the marsh, for any given set of sea level, wave and tide conditions. To overcome these challenges, we have assembled a team of internationally respected coastal scientists with a unique multi-disciplinary perspective (ecology, biogeochemistry, geomorphology and sedimentology) from the Cambridge Coastal Research Unit, University of Cambridge, Queen Mary University of London, and the British Geological Survey. 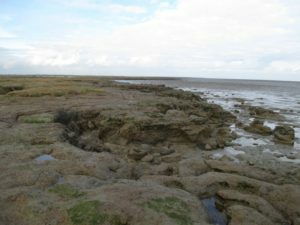 We can only meet those challenges through careful and systematic field observations (we have chosen salt marsh sites in Essex that are rich in clay and silt and more sandy marshes in Morecambe Bay to give us contrast). But there are many measurements we can only do in the laboratory. Sampling will begin summer 2018, when we will start to look in detail at the sediment structure of marshes. We will use innovative micro-CT scanning technology and expose sediments to true-to-scale storm surge conditions in a more than 300m long wave flume in Hannover, Germany. Field and laboratory campaigns will then be ongoing for the next year to allow us to gain a detailed understanding of the geotechnical properties of the sediments. This component of our work involves an exciting collaboration with the British Geological Survey, but also smaller-scale flume experiments and field observations over the seasons. Unmanned Aerial Vehicles (UAVs) will allow us to measure reflected and re-emitted solar radiation from the coastal wetland surface. We can then relate this to the varying soil and plant types that cause greater or lesser stability. Ultimately, our vision is to provide the foundations for a ‘Physical Vulnerability Index’ for salt marshes. This index will allow those responsible for the conservation of marshes and their flood and erosion risk reduction function to map and monitor how likely they are to degrade under increasing physical stress from waves, tides, and storms. Armed with this information, we can be better prepared for the next big coastal storm surge and reduce its impact on people, property, and infrastructure. If you are interested in the results or would like to play a more active part in shaping the direction of this research, please contact us!